Rossman, a teenager with the ability to tap into an energy force known as the "Blitz Force" must save his girlfriend Ericka Debouis from his family's enemy Prof. Ace. During her kidnapping it is also revealed that she is the Princess of a Kingdom in an alternate world called Newlin. Now Rossman must travel through the lands of the Newlin kingdom to save her and stop Prof. Ace from succeeding with his plot to complete the takeover of the kingdom. Along the way Rossman reunites with his younger brother now going by the nickname "Rossboy". As Rossman, you can dash up walls to reach secret areas and higher ground. As Rossboy, you can glide in the air with his hoverboard after jumping or you can charge up with negative energy and perform a super jump to reach impossible ledges. A Challenge Mode that test your skills and knowledge of the levels. Follow the Rossman social media pages! much on IndieDB right now. New screenshots of the upcoming Episode II have been added. Although it is a work in progress expect updates and changes in the final product. New demo on the way! An update on development progress and more from yours truly. Did not succeed on Kickstarter, an update and apology for the lack of consistency. 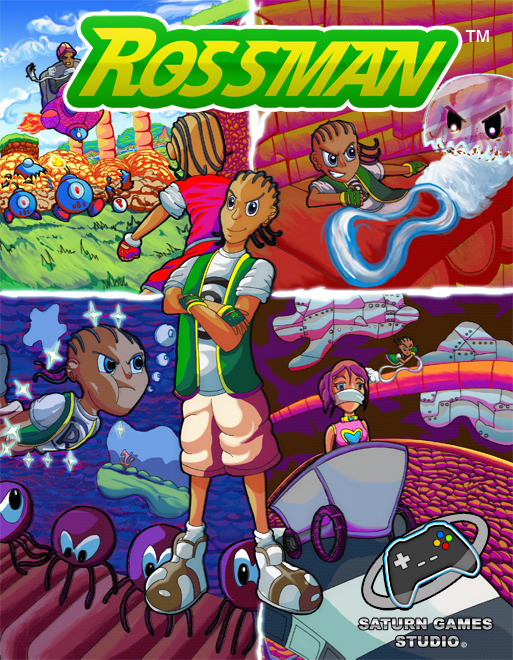 No more delays, Rossman is releasing in 2019. Got a new update for y’all this week! Stay tuned to the page! I usually don't tweet this kind of stuff on this account but its really hard to see a project all the way through when life setbacks arises. Stay tuned next week for a new update is dropping! Good afternoon everyone! Stay tuned later this month! We'll be posting updates again!